It took two weekends and about thirteen hours of work from our framer pal. 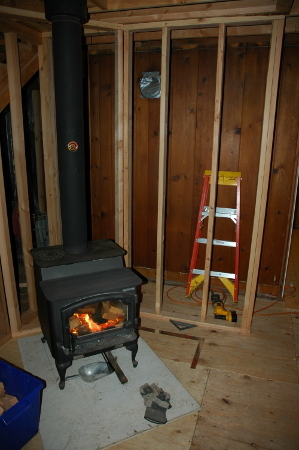 We now have a completed inner wall framing of the upstairs, closet, bathroom, stairway ceiling, stove pipe chase, and wood stove back wall. 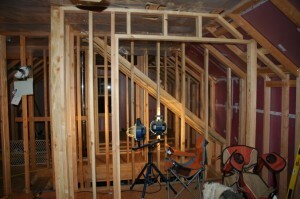 The closet in the entertainment/craft/family room was put in. 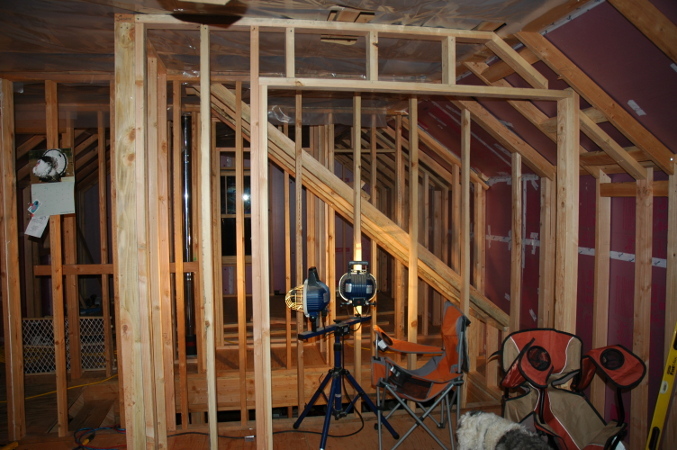 It will have two sections: one for storage and one for a sewing craft center that will pull out of the closet. 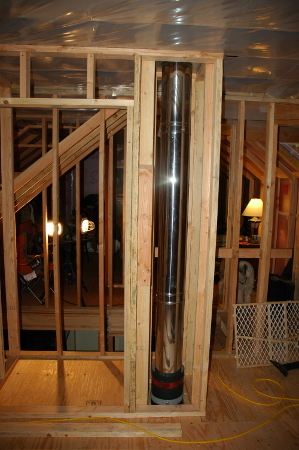 The access to the attic will be located here eventually. The inner wall framing was added for the whole room. 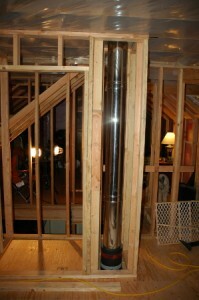 The stove pipe that went through the second floor had a chase built around it. Off to the right side of it there will be a little display shelving to make sure there isn’t any wasted space. The half-bathroom was framed in for our bedroom. 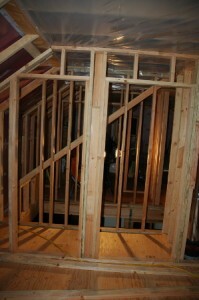 We are going to install a pocket door to save more space. The stairway ceiling was framed. 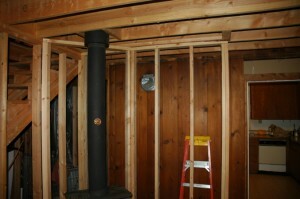 It makes the whole area seem a little nicer then the incomplete wall that was there before. Downstairs the framing around the wood stove was added. 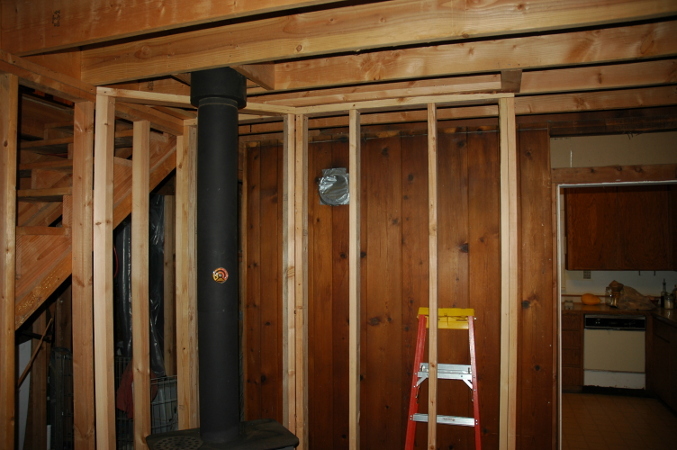 The original wall behind it will be taken out (it isn’t load bearing) and this new section of wall will be the start of an expanded kitchen. 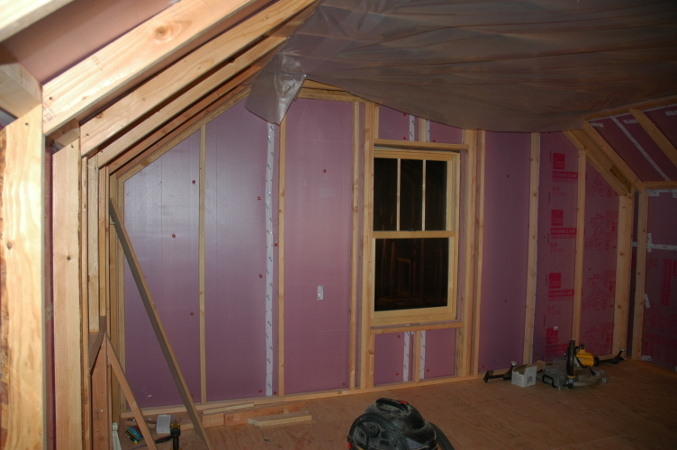 Next up, dormer insulation and rough-in ceiling wiring. Wow. You two have been busy. It’s really starting to shape up. Kudos! That takes a lot of thought and planning, even if it only takes a couple of weekends to implement. Now your work will fly along. 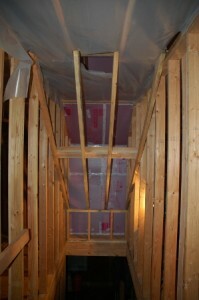 I think there is nothing more beautiful than fresh drywall! Lauren – Yes, I’m amazed by how much thought, design, and redesign has gone into this simple layout. The bathroom has been the source of endless discussions and floorplan versions. Originally it was going to have a shower too, but realized that space constraints suggested there would either be a sink or a shower, but not both. Benita – Yes, we are definitely doing that. I suspect we are only a couple weekends away from some ceiling drywall, so that should be exciting for Robin. Hello Lee and Robin. I am Lauren’s husband Greg, AKA Buck, from the Reluctant Homesteaders. I figured it was time for me to say hi, and join the conversation. You two are doing such a nice job. I enjoy reading your posts, and seeing how you approach your farm renovation. Your list of goals for 2010 is inspiring, and I am impressed at how many items were checked off. It is nice for me to read your pig posts too and I am interested to see how it goes up to the butchering. As a born city boy, the idea of having edible livestock is one I am still getting used to. Lauren’s chickens are egg layers, but we have not eaten them. I am working toward the idea of having a couple of cattle a few years down the road. I have heard stories about cows that become pets and know us well enough to not assume we won’t get attached, but I really don’t want a 1200 pound pet. But the pastures and fences are still a long way from being ready to host any livestock. Anyway, good job, and thanks for the posts. The goals list is good and bad. On the one hand, I like looking at it and say “oh yeah, we did get that done”, but on the other hand … there’s so much more that I thought I would have finished by now. As everyone says, living in your remodel can be hard. It can be un-motivating sometimes, as odd as that seems. I grew up outside town, but it was by no means a farm. Our only animal was a dog. Robin’s childhood was more rural, but although they had chickens and horses, they never raised anything for meat either. It’s definitely a new thing for both of us, but something I think is important. I don’t think either of us are really attached to the pigs, so it should be okay when Jan 15th comes around. We’ll see. I’ll have a harder time with the chickens I think. Yeah, pet cow .. that would be expensive. 🙂 Although, I know a lot of people around here have pet sheep (basically), and then there’s horses … Maybe if you get attached to the cow, you can train it to pull a cart and claim that was your intent all along. Oxen pulled most of the wagons on the Oregon trail. It’s in the heritage around here. Ah yes, the pasture fences are a thorn in my side too. Every time I walk the dogs I’m reminded that I can’t just let them go running like they want to for lack of fences. Really frustrating, but you can only get some many things done at once.